Influenced by both the soulful roots of classic R&B and the spontaneity of the modern singer/songwriter, Dustin Hatzenbuhler's debut album captures the passion and commitment of a young musician dedicated to the craft. 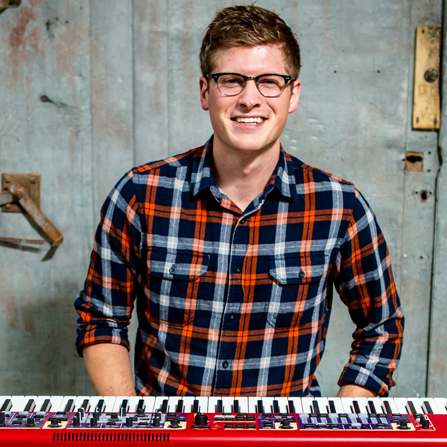 Born a natural instrumentalist, Dustin taught himself piano, guitar, and ukulele, all while fostering his innate gift of vocal range and melody, drawing comparisons to artists like John Legend, Gavin DeGraw, and Jason Mraz. The Minnesota native has been playing shows in his hometown of Minneapolis for years, and has acquired a devoted following while transitioning swiftly from energetic opener to established headlining performer. Since the 2012 release of Dustin’s debut album, "Fall" Dustin has played shows with Eric Hutchinson and Dave Barnes, was featured in the nationwide Macy’s iHeartRadio “Rising Star” Campaign, and most recently appeared on NBC’s popular singing competition show, The Voice. The students loved Dustin! People are already asking us when we are bringing him back again! It is hard to bring in performers that a wide range of students will be interested in, but Dustin was definitely one of the most successful I have seen here! Dustin's show went wonderfully! Having his phone number to contact him prior was great and he was so easy to host! Our tech guys said he was very easy to work with and all his equipment was very simple to plug in & use! Our two hosts that took him out to dinner kept talking about how great he was to talk with and really enjoyed hearing about his experience on The Voice! He was our first coffehouse show of the semester and brought out over 250 people! Such a great turn out!